They also are going to consider an amendment to the U.S. Post Office lease agreement with the Oconee County Industrial Development Authority. The IDA announced at a meeting on Nov. 11 that it wants all of the money from the lease rather than continue to split the lease revenue with the county. These two new items will join three zoning requests from Barton and Melanie Cartey, who are seeking changes in their property on Snows Mill Road so they can continue to operate Antique Acres wedding reception facilities. Greathouse also removed from the agenda a special use request from Robert W. Strickland to make it possible for Verizon to construct a cell tower on his property on Parker Creek Road. 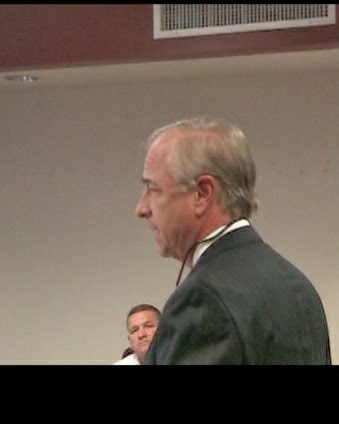 The appearance of the delegation advocating for a new judicial facility at last Tuesday's meeting was made possible by an addition to the agenda released by Greathouse on Nov. 22. Judge Sweat and Berry were joined in the 30-minute session by Superior Court Judge Patrick Haggard, Court Clerk Angela Watson, Probate Court Judge David Anglin, and Magistrate Court Judge Eric Norris. Judge Norris answered one question, but the others did not comment. They proposed building a 62,000- to 70,000-square-foot-building costing $21 to 25 million. At the end of the presentation, Commissioner John Daniell proposed creating a work group of two members of the Board of Commissioners, two members of the Oconee County Board of Education, and two judges to explore the county’s space needs. BOC Chairman Melvin Davis also requested that the discussion be continued at the meeting on Tuesday. The timing of the discussion of new judicial facility coincides with discussions by the BOC about projects to be included on the ballot for a Special Purpose Local Option Sales Tax referendum in May. Chairman Melvin Davis, long an advocate for a new courthouse, has kept himself in the background in the current discussions. Davis did not mention the courthouse when he was asked about SPLOST 2015 at the town hall meeting the BOC held in Farmington in October. Instead, he said the county needed to continue to pay down the debt on the jail and on Veterans Park and focus on infrastructure in the county. This spring, County Administrative Officer Jeff Benko negotiated a 10-year-lease with the United States Department of Agriculture for space in the Government Annex building on Greensboro Highway south of Watkinsville. Daniell had advocated that the space leased to the USDA be used by the county as a way of freeing up space for other needs. Daniell voted against the lease agreement. The judicial delegation said the problem is that the existing courthouse does not provide adequate security because it includes offices for multiple county departments and functions. At its meeting on Nov. 11, the Industrial Development Authority announced that it planned to ask the Board of Commissioners for full revenue from the lease of the Post Office in Watkinsville. Oconee County owns the property and building that houses the Post Office on Experiment Station Road in Watkinsville. At present, the county and the Industrial Development Authority, appointed by the Board of Commissioners, split the revenue from the lease. According to tax records, the 3,542-square-foot-building was constructed in 1980. At that meeting on Nov. 11, the IDA also voted to ask the BOC to include $4.6 million in funding from the 2015 SPLOST for the IDA so it can invest more money in the infrastructure of Gateway Business Park, the facility on SR 316 it owns, and build another similar park. The BOC on Nov. 5 postponed action on the request by the Carteys to rezone 1.6 acres at 2531 Snows Mill Road for their wedding venue. The Carteys asked for the delay because of a death in the family. The Board also delayed action on variance requests that would allow the Carteys to have a gravel rather than paved parking lot in front of two receptions halls and to have a buffer around the business operation. The reception halls have been on the property for approximately a year, according to the Planning Department, and the Carteys have been using the facility to host weddings and wedding receptions. Allen Skinner, chief appraiser for the county, told me that his Property Appraisal Department became aware of the two buildings on the Cartey property when the Carteys sought to have their conservation use designation extended for another 10 years, beginning this year. Skinner said his office informed the Carteys that a business such as theirs is prohibited on property designated for conservation use. Farmland with a state conservation designation and easement is taxed at a lower rate than land not so classified. The Carteys did not receive a conservation use designation for this year, the county tax records indicate. The rezone request is to cut out the 1.6 acres on which the two buildings sit from the larger tract and rezone the 1.6 acres for business, leaving the remaining 43.2 acres zoned as agricultural. The Carteys can then apply next year for a conservation easement on the 43.2 acres. The state program, designed to protect farmland by assessing it based on its soil quality and use rather than on its value for development, uses a complicated formula and values that are updated each year. A farmer agrees to keep the land in farm use for 10 years if she or he participates in the program. An easement is put into place on the property once the farm is in the program, and the farmer pays a penalty of two times the tax savings if she or takes the land out of the program. I contacted Ellen Mills of the Georgia Department of Revenue in early November to get the most recent state values and then calculated the value of the Cartey property had they participated in the program this year. I also asked Carol Gurley in Skinner’s office to review the procedures I used. My estimate is that the Carteys paid considerably more than twice as much in taxes in calendar year 2013 as they would have paid had they been able to keep their land in the state conservation easement program. The current tax is $5,531, based on property assessments in county tax records, versus $2,237 had the land been in conservation easement. The figures are not exact, because I do not know how the county would have assessed a half acre that is not part of the state program. I estimated that value based on the current assessment of the larger property. The agenda for Tuesday’s meeting released by Greathouse on Nov. 22 included consideration of a request by Verizon Wireless to be allowed to build a 190-foot-cell-tower on 25 acres owned by Strickland at 1571 Parker Creek Road. The Planning Commission voted not to recommend to the BOC that it approve the request for Verizon for a cell tower, with several members saying Verizon should use instead an existing tower at 1330 Rocky Branch Road. The attorney for Verizon decided before the BOC meeting on Oct. 8 to ask for postponement of the issue so Verizon could consider its options. NOTE: Sarah Bell recorded the session on Tuesday. I have uploaded it to the Vimeo site for Oconee County Observations. Click here to view it. The ending of the presentation is interesting. Usually Chairman Davis maintains strict standards on what presenters can do before and after making comments to the BOC. In this case, the Commissioners took an informal break after the presentation and chatted with the judicial delegation before taking up other items on the agenda.